-earlier talk at Group Theory 30, Ghent, July 14-18, 2014. # J X Zheng-Johansson "Matrix formulation of QM, IED particles"
31. J X Zheng-Johansson, "Continuous Emission of A Radiation Quantum", Journal of Physics: Conf Series 474 (2013) 012035. -Talk at 6th International Workshop DICE 2012 (Space-Matter-Quantum Mechanics from quantum scale to emergent phenomena), 2012. 27. J X Zheng-Johansson, "Electromagnetic model of neutrino", 2011. 26. J X Zheng-Johansson, "A quantum field theoretic treatment of IED particle (a unified representation of quantum electrodynamics and quantum field theory for particles) ", 2011. 24. J X Zheng-Johansson, "Quantum Gravity of IED Particle, A First Principles Prediction", (Internal, 2010). Abstract communication at ICQNM (2009). 21. J X Zheng-Johansson, "Internally Electrodynamic Particle Model: Its Experimental Basis and Its Predictions", Phys. Atom. Nucl., 73, 571-81(2010); Proceedings 27th Int Group Theoretical Method in Physics, Yrevan, 2008; preprint: arxiv:0812.3951. 16. J X Zheng-Johansson, "Vacuum Structure ad Potential," (preprint) arXiv:0704.0131v1. 15. J X Zheng-Johansson, "Dielectric Theory of Vacuum," (preprint) arXiv:physics/0612096. 13. J X Zheng-Johansson, "Orientation Quantization of Atomic Angular Momentum from Quantum-Electrodynamic Stability Conditions," (in manuscript, 2006). 10. J X Zheng-Johansson, "Gravity between Internally Electrodynamic Particles," arxiv.org/physics/0411245 (updated), with P-I Johansson; J X Zheng-Johansson, with P-I Johansson, R Lundin, "Depolarization Radiation force in a Dielectric Medium. Its Analogy with Gravity*," Quantum Theory and Symmetries IV, 2, Supp Bulg J Phys 33,Ed V.K. Dobrev, Heron Press, 2006, 771-780. The gravity theory is solely ready developed by IOFPR (ZJ) as a prediction in terms of the IED particle model and solutions; the paper is ready written by IOFPR (ZJ); the research is privately funded by Scientist P-I Johansson. 7. J. X. Zheng-Johansson, “Critical velocity for Superfluiduity Motion in Channels Narrower than Micrometers” (preprint) arxiv.org/cond-mat/0410485, Exempt from book 1-59033-974-6, 1590339746, with P-I Johansson. 6. J. X. Zheng-Johansson, "Neutron Scattering by Superfluid He II about Dispersion Minimum,” (preprint) arxiv:cond-mat/0410442; in book 1-59033-974-6; IOP.Eprintweb. 4. 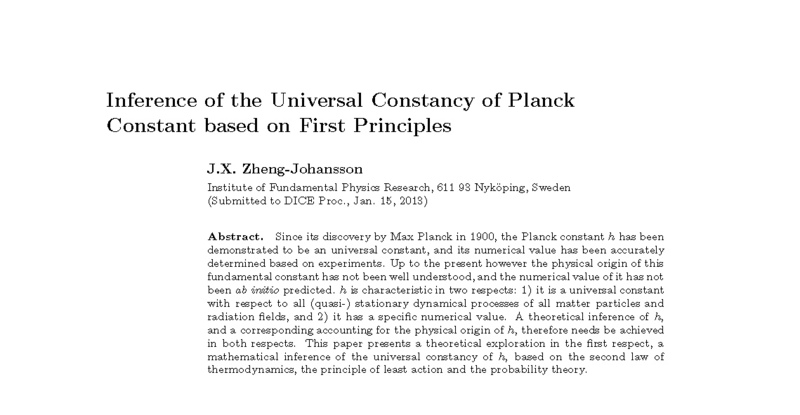 J X. Zheng-Johansson and B Johansson, "The peaked structure of phonon density of states of a confined superfluid - a theoretical prediction, ...", J. de Physique IV, France, vol.10, Dynamics in Confinement, Edited by B. Frick, Zorn and H. Büttner, Pr7-181-184, EDP Sciences, France, 2000. 2008: Talk: J X Zheng-Johansson, "Internally Electrodynamic Particle Model: Its Experimental Basis and Its Predictions", 27th Int Group Theoretical Method in Physics, Yrevan, 2008. 2008: J X Zheng-Johansson, "Doebner-Goldin Equation for Electro-dynamic Particles. The Implied Applications"Abstract/Oral, APS March Meeting, New Orleans, 2008. 2005: Talk: 4th Int Symp Quantum Theory and Symmetries, J. X. Zheng-Johansson, "Inference of Schrödinger Equation from Classical-Mechanics Solution " Varna, Aug, 2005. 2004: J. X. Zheng-Johansson, Inference of Schrodinger Equation from Newtonian Mechanics, Bullet Amer Phys Soc, D10.015 -Charm Quark States, May, 2004, with P-I. Johansson. 2003: J X. Zheng-Johansson, “Fundamental formation of material particles at all velocities”, Bullet Amer Phys Soc, C14.004 Theoretical Physics, April, 2003, with P-I Johansson. 2003: J X. Zheng-Johansson, "Unification of Classical and Quantum Mechanics, & The Theory of Relative Motion" , Bullet Amer Phys Soc, G35.001-General Physics, March, 2003. 1999 J X. Zheng-Johansson, Superfluidity of 4Helium: The Zheng-Johansson Theory , G1545012, Bullet Amer Phys Soc, 1999. 5. J X. Zheng-Johansson, *Inference of Basic Law of Classical, Quantum and Relativistic Mechanics from First-Principles Classical-Mechanics Solutions (updated title), Nova Science Publishers, Inc., New York, 2005, ISBN: 1-59454-261-9. with P-I Johansson. *The IED particle model, vacuum structure and basic solutions described in this book (not yet in print) are in the final forms. Some views, terms and ways of introductions will be updated or revised before printing. /JXZJ, 2010-06-04. 2. J X. Zheng-Johansson, The Microscopic Theory of He II and its QCE Superfluidity Mechanism Applied to Superconductors, The Nova Science Publishers, Inc, New York, 2004. ISBN: 1-59033-974-6. Collaborators B Johansson, J Wilson; non-scientific co-author P-I Johansson. 1. J X. Zheng-Johansson, The Theory of Superfluidity of 4Helium, Published in Sweden Oct, 1998, ISBN: 91-630-7520-2. *d. J X. Zheng-Johansson, "Apply the Achieved 'Unification Scheme for Classical and Quantum Mechanics at All Velocities and Gravitational and EM Forces' for a Treaty of Cosmology and Cosmogony", VR Project Proposal, host location IRF, April 24,2004. *b. J X. Zheng-Johansson, "Uniﬁcation Scheme of the Four Forces” (review of achieved results on : ”Uniﬁcation of Classical and Quantum Mechanics at All Velocities”), VR Project Proposal, host location KTH, May, 2002. *a2. J X. Zheng-Johansson, "Fundamental Construction of Material Particles,” NFR Project Proposal, KTH/host to be located, May(), 2001. *a1. J X. Zheng-Johansson, "Fundamental Construction of Material Particles,” KVA Project Proposal, KTH, Feb, 2001. Dr JX Zheng-Johansson (JXZJ) is the initiator and scientific sponsor of the unification project I-II/ superfluid project, is responsible for the conceptions and developments of the model/theories/schemes, and is responsible for the writings of the scientific papers and books within the projects. The Unification Projects began in 2000, spin-off from Dr Zheng-Johansson's superfluid theory. The original motivation was to give a more comprehensive representation of quantum particles, as the superfluid He II atom is, in respect to quantization, wave phenomena, and excitations, etc. The initial pivotal experimental input used for conceiving the IED particle model were the Davison-Germer and GP Thompson experiments demonstrating (free) electron diffraction, hence the de Broglie wave and relations, the experimental facts of the convertibility (by absorption/ emission) between matter particle's thermal energy and electromagnetic radiation, and that the quantization of matter wave and electromagnetic wave share the common formulas of "Planck constant h /(deB or EM) wavelength" (or h ´ (deB or EM wave) frequency". At a later stage at the vacuum-matter interface, for justifying the IED particle as the unique candidate and that the electrometric waves and their generating oscillatory charge are fully responsible for the de Broglie phase wave function, mass and total energy of a particle, the pair production and annihilation experiments (involved in tracer diffusion exp, introduced by Professor K Skold, as part JXZJ's PhD thesis work at Studvik) provide a crucial indication. The unification project (2003-present) has been privately funded by scientist P-I Johansson who has given continued moral support for the research. Professors B Johansson and N Ashcroft, from their broad expertise in the fields of quantum and classical theories of condensed matter (as assemble of microscopic particles or as continuum), were the first professors who saw the significances of the de Broglie wave solutions for the IED particle (2000-02) and polarizable dielectric vacuum. See further Projects I-II/superfluid project related papers for acknowledgements to the discussions, communications with other physicist, scientists. All papers authored by Dr J X Zheng-Johansson (JXZJ ) at IOFPR are the SOLE intellectual properties of JXZJ; these are the common legal private properties of JXZJ and P-I Johansson. m-h jensen (iranian residing in noway) is FORBIDDEN to steal NONE part of JXZJ’s scientific work + JXZJ-PIJ' s properties (for LIES to an organization) for theft of (+ prostitution off) money, theft of JXZJ’s scientific credit. Ref http://iofpr.org/MemC3.html: On-going/past criminal activities of m-h jensen; filed reports to Police in Sweden/Norway.